After a year and a half of semi-regularly updating The Bard of Boston website, I've decided to leave it behind and move on to a new online endeavor; one that better reflects what I've been up to during the past few months. So, to celebrate the end of an era, I leave you with "The Parting Glass," a song that date backs to at least the 17th century (probably earlier). Below you can find the lyrics as well as a performance of the song by Irish singer/songwriter Glen Hansard. In the fall of 2009, I had an idea. In the words of Dr. Seuss, it was "a wonderful, awful idea." At the time, I was living in Montreal, having just earned my B.A. from McGill University. Instead of moving back to the Boston area to pursue what one might describe as a "real job," I decided to stay up north and write/play music for a living. So, at around the same time I kicked off my freelance writing career (which paid the bills), I also kicked off my music career (which was a lot of fun). During my four-year romp through McGill undergrad, I was lucky enough to meet a slew of talented musicians. I met many of these musicians at Le Vieux Dublin Pub (The Old Dublin Pub) - a pub which would ultimately become my place of employment/second home. From 2006 through 2010, I bussed tables and washed pint glasses at the pub every Friday and Saturday night (my shifts lasting from 10pm till 4am, 5am, 6am...sometimes later. Sometimes much, much later). Every Monday night at the Old Dub was open mic night, which was hosted by local Celtic music legend Liam Callaghan. Without Monday open mic nights - a place where a bunch of us could get together to belt out tunes - Devaney's Goat would never have become a reality. I didn't originally intend to have my own name incorporated into the band's name. In addition to believing that naming a band after yourself is a little self-centered (cough-BonJoviyou'reanasshole-cough), it dawned on me that once the band was assembled, I would be the least-talented of the bunch. Seriously, I'm not being modest here: facts are facts. Nikita was a classically trained guitarist; Mikey, Alison and Emlyn were all music majors at McGill; and Noelle could shred the fiddle like Johnny from "The Devil Went Down to Georgia." I, on the other hand, had only taken a few years of piano lessons when I was in elementary school and a year of guitar lessons when I was in middle school. What I did have going for me, however, was an Irish last name: Devaney (O'Duibheannaigh). When I discovered that there was an Irish fiddle tune with my name in it - Devaney's Goat (also spelled Devanny's Goat, Devanney's Goat and Devanney’s Goat) - that connection to Irish traditional music was too perfect to pass up. Also, it gave us a band mascot: the Goat. 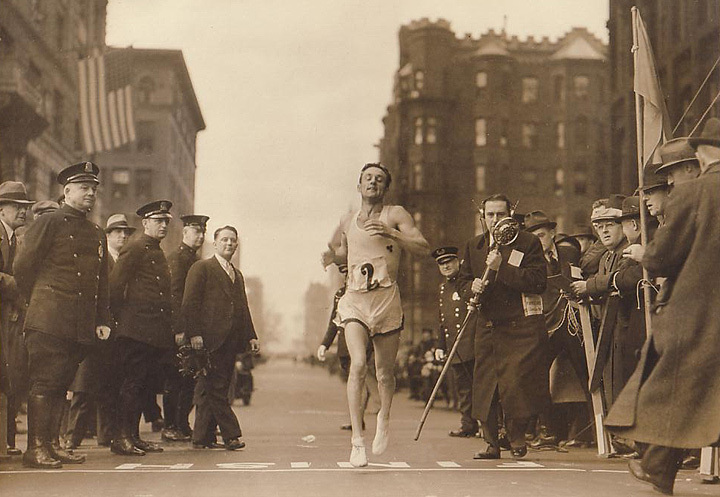 Inspired by the first modern-day marathon held at the 1896 Summer Olympics, the first Boston Marathon is held in 1897. At that first Boston Marathon, there were 18 participants. In comparison, the Boston Marathon now attracts about 20,000 registered participants each year. 26,895 runners registered in 2011. In 1951, during the peak of the Korean War, the President of the Boston Athletic Association - Walter A. Brown - banned Koreans from running in the Boston Marathon. Brown was president of the BAA from 1941 to 1964. Women were not officially allowed to run the Boston Marathon until 1972. However, Roberta "Bobbi" Gibb became the first woman to run the marathon (without a registration number) in 1966. In 1967, Kathrine Switzer became the first woman to run the Boston Marathon with a registration number. (She registered as "K. V. Switzer.") In a famous incident, a race official - Jock Semple - tried to rip off her number and kick her out of the race. During the 1980s, professional athletes began refusing to run the Boston Marathon without the promise of cash rewards. The first cash prize for winning the Boston Marathon was awarded in 1986. The 1996 Boston Marathon, which marked the 100th time the race had been run, set the record for world's largest marathon. 38,708 runners registered, 36,748 runners started, and 35,868 runners finished. Geoffrey Mutai of Kenya ran the fastest Boston Marathon ever in 2011 with a time of 2 hours, 3 minutes, 2 seconds. Margaret Okayo - also of Kenya - set the women's course record in 2002 with a time of 2 hours, 20 minutes, 43 seconds. As in, "I like singing shanties about fishing and whiskey." As in, "Dude, where's my whiskey?" As in, "We have whiskey galore!" As in, "I've had too much whiskey? What a bunch of baloney!" As in, "I will put the kibosh on writing this post if I don't get my whiskey." As in, "I spent all my moolah on whiskey? Welp, I guess that makes sense." As in, "I dropped my bottle of whiskey in the marsh, now it's covered in muck." As in, "That hooligan stole my whiskey!" As in, "Using the word whiskey in every entry on this list is a stupid gimmick." As in, "Yes, I'll have another whiskey." Juliette is a Product Manager at a Boston-area freight brokerage startup. She is a logistics and shipping geek who has her sights set on transforming the truckload transportation industry. Saint Patrick’s Day is no small potatoes in Boston. With almost one-third of the city's population being of Irish decent, the celebrations here are spirited and memorable. But while you are getting ready for the fun to start, remember this: St Patrick’s Day would not be St. Patrick’s Day if it wasn’t for the sober drivers who deliver all of the ingredients and goods required for a guaranteed good time. Guinness, as you may know, is a popular Irish dry stout that originated in the brewery of Arthur Guinness at St. James Gates in Dublin. The ingredients to make Guinness are simple: barely, hops, brewers yeast, and of course, water. On any given day, over 5.5 million pints of Guinness are consumed around the world. On St. Patrick's Day, that number more than doubles to 13 million pints (according to Beth Davies Ryan, global corporate relations director of Guinness). Guinness was one of the first beer companies to own a fleet of ships which they used to ship both the raw ingredients and the finish products in ports throughout Europe, and later, worldwide. The Irish were the biggest exporters of corned beef until 1825. The area of Cork, Ireland was a great producer of corned beef from the 1600s until 1825. It was their chief export and sent all over the world, mostly in cans. Corn beef and cabbage are the staple of any Irish American dinners on St. Patrick’s day. To this very day, making sure all of the ingredients make it on the table in time to fill our bellies requires a high level of transportation coordination. Earlier this week, it was reported by Barbara Maxwell at the AMS department of the USDA that a shortage of trucks was experienced for cabbage from the lower Rio Grande Valley in Texas. The cereal giant General Mills also reaps the benefits of Saint Patrick’s Day. One of their most popular cereal got its name directly as a result of saint Patrick’s day. The little fellow in green tights on the box was named Lucky as a result of St. Patrick’s. The leprechaun got his name in 1964 and was placed on boxes of Lucky Charms after General Mills reported that sales of Lucky Charms tripled on St. Patrick's Day from the 2 billion boxes sold worldwide to almost 6 billion boxes. What happens when your girlfriend takes the car and spends the weekend visiting friends (and you're left at home with a fridge full of beer, a cabinet full of whiskey and a head full of memories from St. Patrick's Days past)? Answer: this happens. For anyone who's interested, I recorded "The 17 Days of St. Patrick's" using an old MacBook, an M-Audio FastTrack guitar/mic recording interface, and a Shure PG58 mic. The guitar you hear is an Alvarez AJ-60SC. For many Americans, the Emerald Isle is a land of smiling eyes, freckled balladeers singing "too la roo la roo la," and dancing leprechauns (who make our breakfast cereal magically delicious). 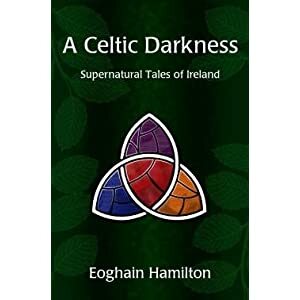 Eoghain Hamiliton abandons this Americanized, romanticized notion of Ireland in his book, A Celtic Darkness: Supernatural Tales of Ireland, and instead presents an Ireland that suffers from a troubled past as well as an uncertain economic future. But as the title suggests, A Celtic Darkness is not grounded firmly in the realm of reality. Hamilton cleverly mixes his raw, fact-based view of Ireland with the realm of the supernatural. Ghosts lurk in the centuries-old cemeteries, skeletons lie waiting in ancient underground tunnels, and banshees make their rounds to country homes, warning occupants of impending death. The short stories that comprise A Celtic Darkness will all succeed in raising the hair on the back of your neck and - in some instances - nightmares may ensue. However, Hamilton does not rely on gory descriptions for scaring your pants off (although - spoiler alert - in one story someone is decapitated by a shovel). The unifying feature of all of these stories is that the plots initially seem believable (or at least plausible) and you can easily put yourself in the protagonist's shoes. Examples: a man visits his childhood home and old memories begin bubbling to the surface; a young, arrogant businessman is invited to a Halloween/Samhain party, but refuses to participate in the supernatural festivities; two college students experiment with mind-altering substances around a bonfire. After finishing the book, I couldn't help but think to myself: "Do any (or all) of these stories have a basis in Hamilton's own life experiences? Does he actually believe in ghosts, banshees and the like? Has Hamilton experienced 'a Celtic darkness' first hand?" Eoghain Hamiliton is originally from Cork, but now lives with his family in South Boston.